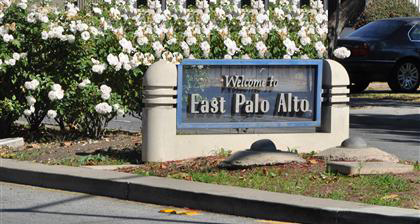 One of the most diverse cities in the entire nation, the city of East Palo Alto has managed to maintain its strong rural heritage and intimate community spirit. African American, Latino, Pacific Islanders, Vietnamese, and Japanese American enclaves are all woven together in the fabric of East Palo Alto — a fact that introduces cultural riches as well as challenges for city planners. Because East Palo Alto has yet to share in the wealth of the high-tech boom that has transformed many of the Bay Area towns within the last decade, government leaders have developed aggressive new programs geared toward preparing area youth for the prolific opportunities that surround them in the fields of computers and electronics. The innovative organization of “Plugged In” is working closely with leading companies to bring computer technology to the entire community. This small, suburban community is centrally located 30 miles south of San Francisco and 25 miles north of San Jose. A long-established, mid-peninsula city consisting of older residential neighborhoods, East Palo Alto offers housing options in a variety of architectural styles and price ranges.